Statement lips are always on trend during the Fall and Winter, but for the holidays you might want to amp it up just a bit further. Glitter has been making its appearance in the oddest places lately, even in hair, so why not on your lips? 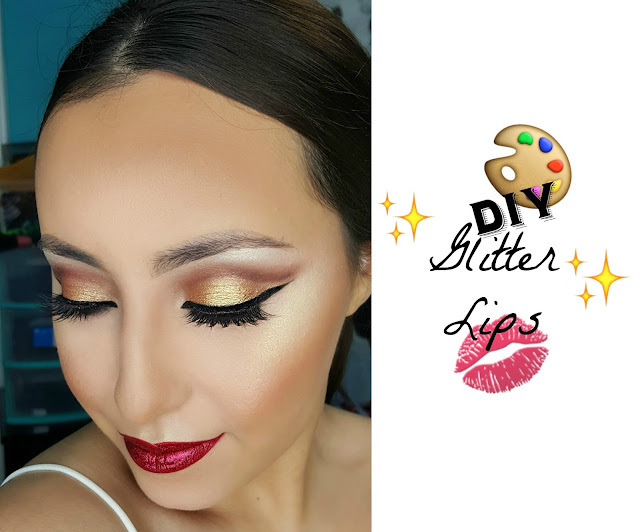 The addition of glitter gives your lips a metallic quality and that reflectiveness, in turn, makes your lips look more luscious and plump. While this might not be the most practical of holiday tutorials, it sure is fun and will give you that added pop in photos. Plus, you probably have this stuff laying around your house already, so you won't need to go out and buy those expensive glitter lip tattoos. Cha-ching. Money saved--you're welcome! 1♥ Before I do any lippie, I like to start off with a fresh base. I wipe off any foundation that may have gotten on my lips and then I apply a lip balm just to make sure there aren't any chapped, flakey bits. My HG lip balm of all time is the Jack Black Intense Therapy Lip Balm in Natural Mint. This is the only lip balm that works for me and the minty-ness seems to plump up my lips slightly. 2♥ After my lip balm has settled for about 5-10 minutes, I go in with a lip liner. This will be particularly helpful to you if you have trouble staying inside your lip lines when applying lipstick and it also prevents your lipstick from bleeding into fine lines. I used the NYX Lip Liner in Hot Red. 3♥ Then, I went in with my red lippie of choice. I went with the one that has my favorite long-lasting, comfortable formula, which is the Sephora Cream Lip Stain in Always Red. I applied this to my entire lip area and let it dry completely before moving on to the next step. 4♥ Now it's time for the glitter. Just like when you apply glitter to the eyes, you need put an adhesive on your lips to ensure that the glitter sticks and doesn't end up sliding all over your face throughout the night. With a lip brush, I applied the LA Splash Splash Proof Sealer Base to my entire lip area. You want to coat it with a nice thin, even layer. Then, with the same lip brush, I dipped into my red glitter of choice, Mac Red Glitter, and dabbed it onto the base. You want to dab and not swipe so that the glitter doesn't fall all over your face. 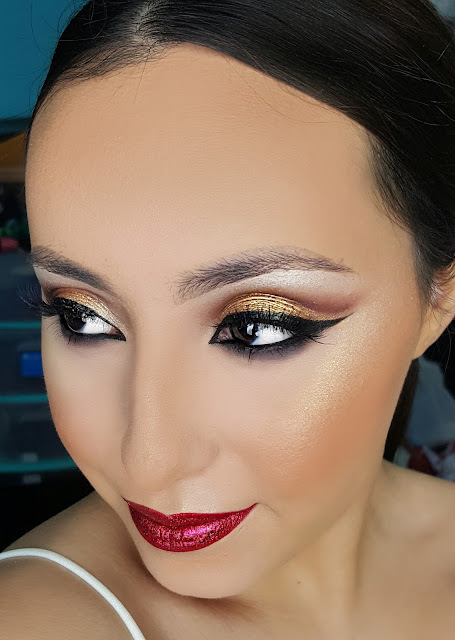 I work in small sections at a time, making sure that each area of my lips were coated very opaquely with the glitter. If you want even more shininess at this point, you can add a clear gloss over the top.